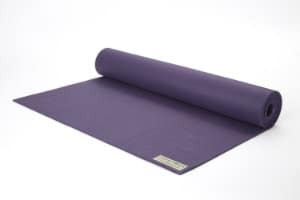 Home › MindZBlog › Review: Let’s Find YOU The Best Yoga Mat To Do Some Yoga! Review: Let’s Find YOU The Best Yoga Mat To Do Some Yoga! Today we are going to be reviewing what is the best yoga mat and learning a little bit about why we use them. Yoga mats were not always used for yoga, but they have become an important piece of equipment of any yoga practitioner. Technically, you could do yoga without a yoga mat, but there are lots of reasons why you should use one. One reason is the comfort. Unless you have the option to do yoga somewhere on a meadow, you will most likely be forced to do it on a hard surface. For lots of women, doing certain yoga poses on hard surfaces is an unbearable task. Because of it, doing yoga could become a chore, instead of a fun and invigorating experience. Another reason is hygiene. If you practice yoga in a studio, that studio probably has an option to rent you a yoga mat for each practice. But why would you use yoga mat that's been drenched in sweat by who knows how many different people? And besides, what if that mat is too thin or too thick for your taste? A good yoga mat is always a great investment and will bring you use throughout life if taken care of. We hope that these yoga mat reviews will help you find the right option. When it comes to yoga mats, even though they have various features, they break down only into two types: whether their cell structure is opened or closed. Yoga mats with opened cell structure tend to have a superior grip which means you will not be in danger of slipping and hurting yourself while doing complicated yoga poses. Open cells efficiently absorb your sweat, giving you a perfect grip from start to finish. However, that means you will have a more difficult time cleaning it and it can be hard to get it hygienic again. On the other hand, closed-cell yoga mats successfully block sweat from entering them, which makes it great for keeping them clean. You can just wipe them with a wet tissue. But, since they don't absorb sweat at all, that means that all the sweat coming out of you will be stuck on the surface of your yoga mat, making it slippery. There are many different brands of yoga mats. Some of the brands reviewed here are Manduka and Jade. Manduka was founded by Peter Sterios. A former architect, Peter fell in love with yoga and along the way got fascinated by simple black yoga mats that helped him improve his skills. Inspired by those yoga mats, Peter decided to make yoga mats of his own, to improve other people's yoga skills as well. The name "Manduka" comes from a yoga pose called Mandukasana or frog, which was one of the favorite positions of his mentor, Shandor Remete. Manduka's goal is to, whenever that's possible, make yoga mats from renewable sources so the environment is impacted as little as possible. Manduka is oriented toward simple, yet efficient yoga mats with excellent grip and durability. They are a big company and their stores can be found all over the US. Many yoga practitioners think of Manduka as a creator of top yoga mats. Jade Yoga started as a rug manufacturer over 100 years ago and have slowly transformed into a yoga mat company. Their real production of yoga mats started in early 2000's when they realized that most yoga mats lacked a decent grip and were too slippery for most of the yoga positions. They decided to tackle that problem and it seems they have succeeded. They decided to produce yoga mats that are made of natural material, eco-friendly and free of PVC and any harmful materials. They managed to achieve a high quality, non-slip yoga mats that are not harmful to the environment. Their entire production of yoga mats is in the US, so they can keep a close eye on how their yoga mats are made, and what goes into them. Since they are eager to be environment-friendly, they decided to plant one tree for every mat sold. So far, they planted over one million trees. In this yoga mat review, we collected some of the finest yoga mats on the market, hoping that will help you decide which one is the best for you. Made by Jade Yoga, this mat is one of the top rated yoga mats on the market. It's also the most eco-friendly yoga mat there is. It is 100% natural, made from rubber, and completely free of harmful toxins. It has an open-cell technology, which means you w﻿﻿﻿﻿on't have to worry about slipping, no matter what yoga position you are in and no matter how much you sweat. Because of it, you might have a harder time cleaning it, but soap and water will be enough to make it completely hygienic for next practice. Being only 3/16'' thick, it's one of the thinnest yoga mats on the market and as such might not be suitable for users looking for maximum comfort. But, this also means it is extremely light and can be easily carried around town or even on a trip. To make it last as long as possible, do not leave it in the sun. Manduka PROlite comes in two different lengths: 71'' and 79''. Both are 24'' wide and 5mm (a bit smaller than 1/4'') thick. With the weight of 4.0 lbs (or 4.6 lbs for the longer version), it's somewhere in the middle. It's not the best option for traveling, but it's not that bad, either. It's made out of natural materials, free of any kind of harmful substances. It doesn't contain latex, either. It has a closed-cell surface, which means that it doesn't absorb sweat, but it still provides an excellent grip. Because of it, it's very easy to maintain and you can always be sure that your yoga mat is hygienic. Manduka guarantees PROlite's durability and superb performance and it backs it up with a lifetime warranty, claiming it won't peel, flake, or degrade in any way. In fact, it may even become better over time. This makes PROlite a very smart investment that will last you forever. Manduka PRO is PROlite's bigger brother and it also comes in two sizes: 71'' and 85''. While 71'' will be long enough for most women, it is nice to have a longer option of 85'', which is probably the longest yoga mat on the market. Very few women will find it too short. Both lengths are 1/4'' thick, and 26'' wide, which is more comfortable than the usual width of 24''. It's great for women who find PROlite too thin or not long/wide enough. But it also costs more than PROlite. Of course, such large dimensions come with a price. The shorter version is 7.5 lbs, while the longer version is 9.5 lbs, which makes Manduka PRO unsuitable for longer trips or to carry it around town. But if you only practice at home, this should not concern you. It's very durable and it even improves over time. It's 100% latex-free, so it's perfect for people who are allergic to latex. It's no wonder Manduka PRO is one of the best rated yoga mats on the market. Jade Fusion is 24'' wide and it comes in the different lengths: 68'' and 74'', which is suitable for most women. It's 5/16 thick making it one of the thickest yoga mats in this review. It's perfect for people who need thicker yoga mats due to sensitive knees or simply because of extra comfort. It uses an open-cell technology, which means you won't have to worry about your yoga mat slipping as its grip is top notch. Just like with any other mat with open cell technology, it is harder to clean. All Jade Yoga products are made in the US and contain only eco-friendly and toxin-free materials. Jade Yoga uses only natural rubber for making their yoga mats. Because of it, their mats tend to have a certain rubber odor, but that wears off in a couple of weeks. It comes in several colors, but you might like to know that if you pick teal, Jade Yoga will donate $5 to ovarian cancer charities. It will also plant a tree, regardless of the color you choose. This yoga mat is one of the lightest yoga mats on the market. It weighs only 1 pound and as such is perfect for traveling. Despite its small weight, Sol Dry-Grip has a decent thickness of 5mm (a bit less than 1/4'') which is a pretty standard thickness that most users will find satisfying. It comes in 68'' and 74'' version. 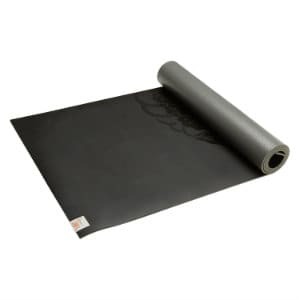 It's made out of PVC, which is great if you are looking for yoga mats that are made strictly out of natural materials, but it does make it efficient as it successfully prevents sweat and bacteria to enter it, making it as hygienic as possible and really easy to clean. You won't have to worry about odor, either. Top coat is made specifically to repel moisture during your practice so you will always have an outstanding grip, making your yoga experience safe and enjoyable. And the more you sweat, the better the grip will be, making this mat perfect for hot yoga or power yoga. It is challenging to pick only five yoga mats, as there are so many of them. Here are another 5 of them that didn't make it into top five but are still a very good buy. Only 1/8'' thick, this yoga mat might not appeal to everyone, but it's very light and durable. It comes in an amazing variety of prints and with each one sold, Gaiam donates $1 to breast cancer research. You can choose a thickness of 1/8'' or 1/4'', and several different prints. It's completely made out of PVC which makes it easy to clean. It offers a solid grip and a decent comfort. 1/6'' thick and 68'' long, eKO Lite is very light and suitable for travel. It's made out of natural rubber and is 99% latex free, making it a good choice for people who are sensitive to latex. Now Athletics offer a lifetime guarantee for this 1/6'' thick and 72'' long yoga mat. It's latex and rubber free, as well as hypoallergenic. It's designed to prevent any germs or sweat entering it, making it extremely hygienic. Being 78'' long, this yoga mat is perfect for taller women and it's 5mm thick which is comfortable enough. Made out of PVC, it's very light and has a great grip. ● Durability. You want your yoga mat to last you as long as possible. For the rest of your life, preferably. Lots of it depends on how well do you take care of it (cleaning, storing) or what kind of yoga are you practicing. But it also depends on the yoga mat itself. Some of the yoga mats in this review come with a lifetime warranty and they are a good pick if you want to make sure your yoga mat will last you forever. ● Grip. Very important factor. If your yoga mat tends to slip often, you are in danger of hurting yourself. Always look for a yoga mat that doesn't slip even when you are sweaty. ● Thickness. That's mostly a matter of personal preference. Try to pick the one that is as thin as possible, without making you uncomfortable. The thicker the yoga mat is, the more unstable it is. Thicker yoga mats are also heavier. Find the golden middle between comfort and stability. Having a great pair of yoga pants can help with the padding on your knees so you could go with a thinner one. ● Size. This one is self-explanatory. Find the width and length that suit you. When you are lying down, your entire body should fit on the yoga mat. If you already have a yoga bag then make sure it isnt too big for the bag. ● Impact on the environment. For lots of yoga lovers, the environment is sacred, and they tend to live in a way that doesn't hurt it. If you are the same, make sure your yoga mat is eco-friendly and made out of recyclable materials. Eco-friendly yoga mats are usually made out of natural rubber or some other natural material and don't contain any substances that are harmful to you or to the environment. This video shows you what to consider when buying a yoga mat. With so many different mats, it can be hard to choose the right one for you. It all depends on what thickness you are comfortable with, and what kind of material do you want. Some people prefer rubber due to its eco-friendly characteristics while other prefer PVC as it is usually easier to clean. No matter what yoga mat you choose, always make sure that it has a reliable grip and that it's thick enough for you to properly enjoy yoga, read a b﻿﻿ook, or use as a pad when camping. As the thickness increases they tend to become more unstable. 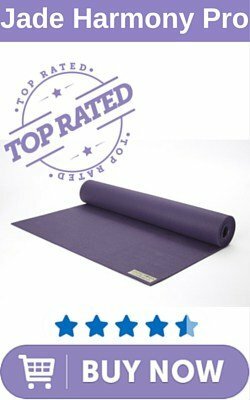 We hope this review was informative enough to allow you to choose a perfect yoga mat for yourself. The post Review: Let’s Find YOU The Best Yoga Mat To Do Some Yoga! appeared first on MyFreeYoga.